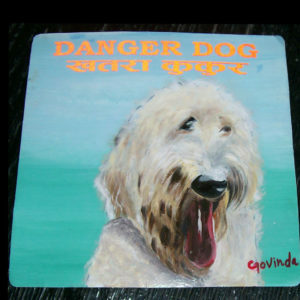 Labradoodles are a perennial favorite for Danger Dog lovers. Here is what is still available. 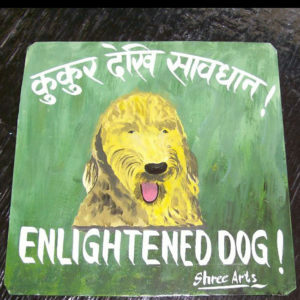 Govinda used reflective lettering that he hand cut for his portrait of Aussie the Australian Labradoodle. 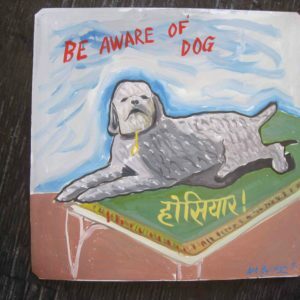 This would make this very practical at the end of a driveway, warning all interlopers of a potential Danger Dog. Manhattanites are lucky. 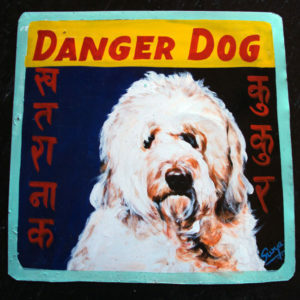 This signboard is available at Prudence Designs at 347 W 36th (between 8th and 9th Aves). Call them at 212-691-1356 to see them. 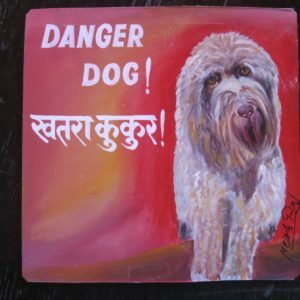 This sweet portrait of Lola the Labradoodle is by Amar Shrestha. 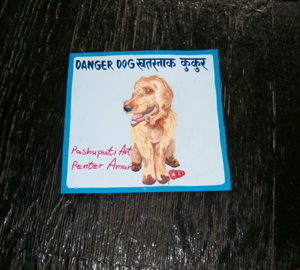 Hand signed by the artist in red sharpie. 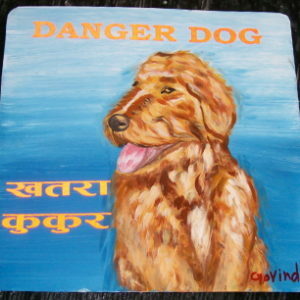 This handsome Danger Dog is a Labradoodle named Aussie. 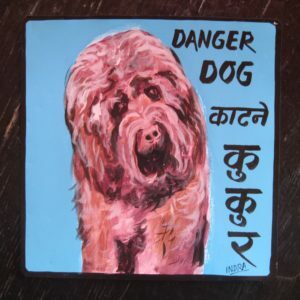 Aussie is hand painted on metal by the sign painter, Baba. 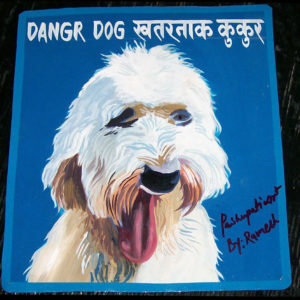 This full length portrait of Aussie the Australian Labradoodle is hand painted on metal by Sagar. 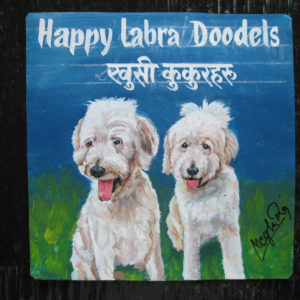 Lars is a beautiful brown Labradoodle, here hand painted on metal by Indra Lama with a bright and vibrant blue background. 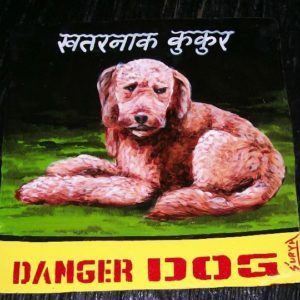 Lars is striking against the sunset toned background as painted by Megh Raj. 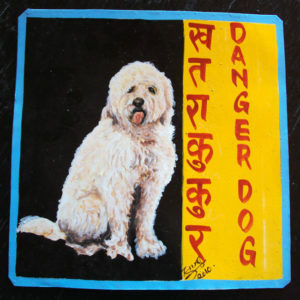 Folk art Labradoodle hand painted on metal by Baba. 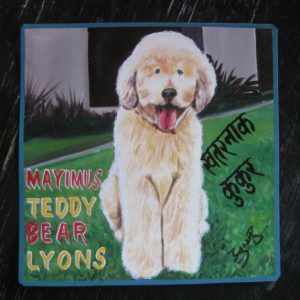 Maximus the Labradoodle is hand painted on metal by Sagar. 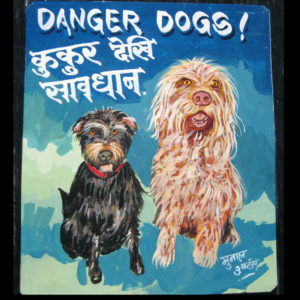 Louie and Marley are Danger Dogs as well as good friends. 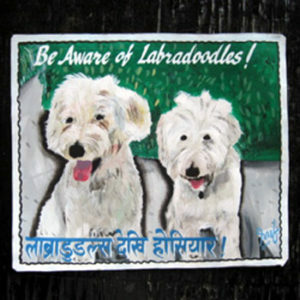 Louie is a terrier mix, while the red-haired Marley is a Labradoodle.